Going to college is a HUGE step in everyone’s life and a lot of things change. When you move into your first apartment or dorm, you’re pretty much on your own. You are responsible for hanging pictures and putting up curtains, and if anything breaks, guess who has to fix it? YOU. Prepare your student for every possible non-academic emergency. Here is a simple toolkit that you can put together for your first home away from home. Tape: Whether there’s a massive leak in your blow-up mattress or you’re wrapping presents for your roommates, I promise you that you will need tape some time in your college life. Multi-Tool: A multi-tool, such as a Letherman, is a great accessory to have at an affordable price. It should be able to handle most needs a young college student may have. Hammer: Every college student needs a wall tapestry. How does one hang up a wall tapestry? With a hammer and nails, of course! Tape Measure: When living in a dorm or a college apartment, a 10-foot tape is all you need to arrange furniture, move appliances, or hang pictures. 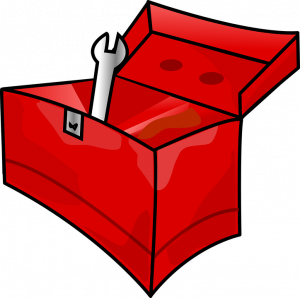 **Warning** This toolbox does not apply to everyone. I, personally, found it helpful since I am clumsy and tend to break a lot of stuff.